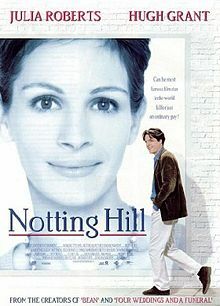 Notting Hill is a 1999 British romantic comedy film set in Notting Hill, London. It is about the changes in the life of William Thacker, a simple bookshop owner, when he meets and falls in love with Hollywood star Anna Scott. Familiarize yourself with the following notes on cultural information and contextual vocabulary in the video. Watch a scene from the film which shows a dinner conversation. In this scene, the characters (as shown in the pictures below) attempt to win the last brownie (cake) by telling a sob story about his or her life - it is a contest for the biggest underachiever. Answer the following questions while watching the clip. Fill in the blanks below with the words provided in the box. Use the appropriate form of the words to make your choice grammatically correct. Replace the underlined words/ phrases in the following sentences by finding their synonyms online (the first letter of the synonym is given to you).